Hop Nosh IPA brewed with tangerines pours golden with orange hues and a solid head and lace. The wonderful aroma is floral and—you guessed it—very suggestive of tangerine. 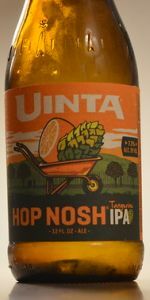 Unita’s fruity twist on a flagship is bursting with citrus and juicy tangerine depth from zest to flesh. Flavor-wise it’s tart with a well-rounded bitterness that's grassy, leafy and piney with a slight oiliness. The sweetness is low and the malt character is soft and bready. Overall, the beer is dry with a lingering pithiness and well-hidden alcohol. A deliciously balanced IPA, which allows the tangerine to shine. As reviewed in BeerAdvocate magazine #114 (July 2016). Poured from 12-oz can into tumbler. Clear dark amber color with long-lasting white head that leaves lots of sticky lacing. A little fruit on the nose along with the typical IPA aromas. Tangerine flavor is subdued, but begins to assert itself as the beer warms. Nice resiny finish, very well balanced. Clear light gold color with white cap. Aroma of piney, citrusy hops with a definite lean toward citrus. Taste on entry is hop forward (natch, it's 84 IBU) , piney hops with a fairly strong addition of tangerine. I can't tell how much of the flavor is due to fruit or hops but tangerine it is. A rather full on tangerine, more like essential oil than zest or juice. The brewer says this is a take on their traditional IPA but I find the malt presence much diminished, almost lacking else I would've scored it higher. Clean finsh with an almost surging hop bitterness in the aftertaste. Medium texture with balancing carbonation. Unapologetically hop bitter and fruit dominant, I don't see exactly where this one fits in. Too bitter for food, too lacking in taste other than hop bitter fruit, and not exciting enough to set a few aside for guests. Guess I'll just have to finish the six pack. Coming from the normal Hop Nosh makers, I got to say that this version is a little more heavy feeling, with less adaptability or spontaneity and more predictability on a recipe that already had it going good without it. Kind of reminds me of what Modus Hoperandi and multiple other brews have went for but not quite as successfully. Golden amber, semi transparent beer. Soapy head.. Lighter lacing on the glass then others I've had today, heavier feeling though. Slightly artificial in tone and kind of unnecessarily bitter, throwing me off of my ball game when it comes to my drinking reviews. Maybe it's just me but I would've preferred another beer, Uinta. This is a really burpy, filling beer. There is that little bit of tangerine but also a lot of darker sour, more intense peel of the fruit minus the tartness, the bitter rind, and more sticky carbonation then a normal Hop Nosh. Smell is okay. Didn't know what to expect but I thought this would be one of the better beers in my mix a six. It's alright though. Bottle from Brewers Haven. Seemed like a good idea, but the mix with the tangerines gives this brew some soapy characteristics. Hop Nosh is great, but here the citrus detracts from the original. Flowery, hibiscus aromas and flavors, and that's what lingers, leaving you feeling like you've just washed your mouth out with soap. After having tried New Belgium citradelic IPA, and being very let down, I had high hopes for this one. I was not disappointed. Granted this is based on personal taste for the most part, I'm a big fan of orange, tangerine, and those sorts of citrus. But I really think Uinta knocked it out of the park with this one. Dark amber/orange color, clear, orange cream head with a fair amount of lacing and excellent retention. The aroma is citrus, orange & tangerine. Bread-like malt and herbal notes as well. The flavor is similar. Packed with that citrus hops. Light malt and some spice in the aftertaste. Crisp and dry in the finish, yet still a juicy beer. Very good.